Safe House has a cast full of actors who would make any director blush with confidence, but each and every one of them is used as scenery for the action scenes. Action thrillers have always been easy targets for dissection because of their basic content, which usually includes bullets and car chases that are raised to the highest decibel level. In the past few years, however, a new sub-genre has developed within this format. That would be the “rogue CIA operative out to prove his innocence” category, manifested from America’s love and hate for political corruption that starts at the very top of the food chain. There have been too many films of this nature lately (not to mention that Bourne did it first and the best) that the substance occupied within it is almost fully tapped. If Safe House had been released three years ago, maybe it would stand a chance as opposed to today’s raised standards for the quality in political intrigue. 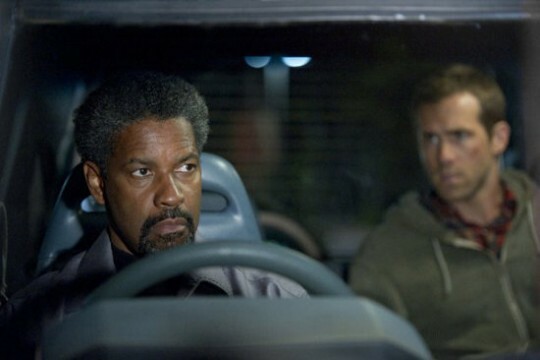 Not even a star like Denzel Washington, who has done his duty in the past at keeping mediocre action thrillers afloat, can help Safe House feel too safe for its own good. 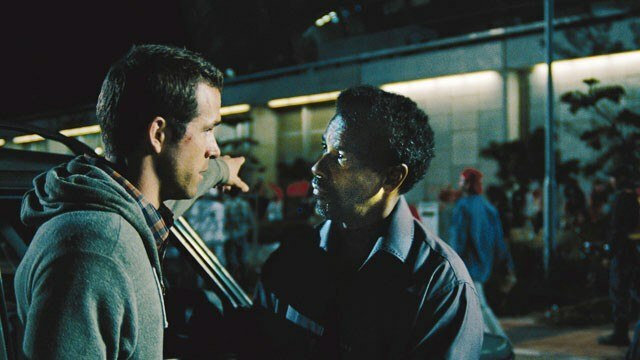 Ryan Reynolds is introduced as a low-level CIA agent tasked with looking after a safe house in Cape Town. His activities usually range from throwing a ball against a bare wall to phoning his boss asking for a promotion to a more exciting venue, like Paris. Reynolds is made out to be an everyday guy who has no field experience, yet he desires for a chance to prove himself outside of the lonely enterprise he is given guard duty over. Well, as luck would have it, a former CIA agent (Washington) with every skill in the book has recently given himself into custody after years of “supposed” traitorous activity against the US government he once worked for. He is brought into Reynold’s safe house with a team full of tough hard-nosed individuals, led by Robert Patrick. These is where Safe House could have developed more of a back-story for Washington and have Reynolds discover something fishy going on beyond the illegal means of torture occurring right in front of him. But without hesitation, a band of well-armed mercenaries show up looking for the houseguest who is literally wanted by everyone who owns a gun. Reynolds of course escapes with Washington and the film turns into a buddy picture that features enough chase scenes and gunfire to tire out even the most diehard action fan. In between all the violence there is the mandatory moments in computer filled rooms where the CIA big brains try to comprehend what’s going on, even if they always appear to be three moves behind. Veterans like Brendan Gleeson, Vera Farmiga and Sam Shepard are given borderline transparent roles, each shouting out orders to underlings to be briefed on who’s who since things become confusing fast. It’s obvious one of them is evil and orchestrates all the string-pulling behind closed doors of the CIA. But all resolution is saved for a climax that has unanswered questions solved with characters shooting one another to provide a clear understanding of who is good and bad. Reynolds is a good choice to play the naïve rookie who gets in over his head quickly, but once he turns into Rambo all principle is thrown out the window. For someone with zero field duty, he is exceptionally good at doing perfect ninety degree turns in a BMW while getting shot at and being choked to death all at the same time. Washington on the other hand gives a commanding performance mainly because he is a commanding actor. His versatile nature is seen at times, usually when he injects humor into the painfully mundane proceedings of shaky action and robotic dialogue, but he is once again wasted. The repetition that occurs in Safe House, not to mention the genuine silliness of it, obliterates any sense of realism. Never before has a film had so many instances where people suddenly get shot from an off-screen position, it starts to become comical throughout the film. The script has this happen over and over again to the point where every audience member can expect what is about to happen before any gun is actually drawn. No matter how gritty an action scene is filmed, if it resorts to the same reused conclusion the effect of surprise wears off quickly thereafter. Safe House has a cast full of actors who would make any director blush with confidence, but each and every one of them is used as scenery for the action scenes and set pieces. Reynolds and Washington go through the motions and any relationship meant to be established between them is too hard to take seriously. The script is as dumb as nails, but it could have separated itself from the countless other clones it bears resemblance to if more time was focused on the two lead characters, beside the cliché traits applied to them from the get-go. Safe House really doesn’t know how bland and unoriginal it is, and the same can be said for all other movies that follow the same design. Maybe it’s time for the US government to be used as a good means for covert operations, that would at least shake things up a bit.